"This is the most delightful chocolate dessert that you will ever taste!" Cut chocolate cake into large squares and place on a baking sheet or large baking dish (see Cook's Note). Pour coffee-flavored liqueur over cake and set aside. Prepare chocolate pudding with milk according to package directions. In large trifle bowl or other glass bowl, crumble half of liqueur-moistened cake. Top cake with half of chocolate pudding, half of crumbled candy bars, and one container of whipped topping. Repeat with remaining cake, pudding, candy bars, and Cool Whip(R). Shave chocolate with a vegetable peeler for garnish; sprinkle over top of dessert. Keep refrigerated until serving. See how to make a super-easy, no-bake dessert with instant vanilla pudding. You can use a 9x13-inch cake for this recipe as well, either made from scratch or from a mix. I have made this several times before and used brownies instead of cake mix. I also have used chocolate mousse instead of the pudding. It is always a treat! This was good, but it must be eaten in one setting, if you store the leftovers, it gets very runny due to the Kahlua. Sinfully good. Very high in fat. 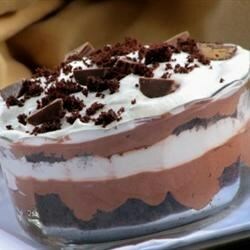 I lightened the fat by using fat free whipped topping and skim milk in the pudding. It was still excellent.